The Club Marine Australian Marine Export & Superyacht Industry Awards are presented annually to reward the outstanding achievements of Australian marine industry exporters and the Australian Superyacht industry manufacturers and service providers. This year, Rivergate Marina and Shipyard have been awarded for their outstanding effort and outcomes in 2013. Rivergate were awarded the ‘2014 Superyacht Industry Business of the Year – Service Provider’ award. 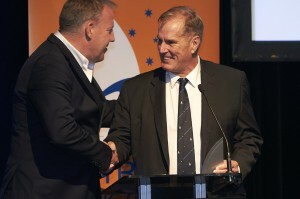 The Awards were announced at the Industry Gala Dinner at the InterContinental Resort in Sanctuary Cove, Queensland. Rivergate Marina and Shipyard is located on the Brisbane River adjacent to the Gateway Arterial Bridges. The facility is close to the centre of Brisbane, the mouth of the River and Brisbane’s domestic and international airport. With 105 marina berths, Rivergate can accommodate vessels up to 80 metres. All berths have fresh water and shore power (up to 200amp), with access to WI-FI and onsite amenities of laundry and café. Rivergate Marina & Shipyard is now Australia and South Pacific’s leading premier Superyacht refit and project management destination. Rivergate attracts superyachts from around the world and offers a management package to suit the vessel and utilize other facilities to ensure that these vessels make it to our shores. Rivergate is a privately owned marina and shipyard established in 2006. They have developed their knowledge and skills in order to compete with other long standing, international world class facilities.